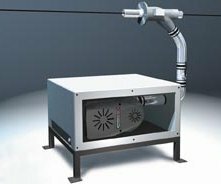 Sonic Air System's high velocity air knife drying systems are the only blower based products capable of handling modern production speeds, up to 10,000 feet per minute, in the wire and cable industry. Production rates have increased along with product quality objectives - SAS air knife drying equipment is designed to satisfy your drying requirements. Due to worldwide legislative efforts, solvent based inks and coatings have been virtually eliminated in the wire/cable industry, resulting in a surface that needs to be cleaner and dryer than ever before to handle new water based inks and coating products. Compressed air systems used in older Wire and Cable manufacturing plants were installed when utility costs were low and the cost of energy consumption wasn't monitored as it is today with regards to increasing the bottom line. Now PLC's monitor every aspect of modern Wire and Cable lines, helping identify the source of downtime and production slowdowns. When printing, inspection, testing or packaging adversely affects the manufacturing process, Sonic Air Knife Drying Systems are to be counted on to eliminate moisture. Sonics Air Knife Drying Systems typically have a relatively short R.O.I. due to increased efficiencies - the R.O.I is usually within 6 months. Sonic offers several variations of this rigid extrusion or jacketed cable dryer for 1/4" to 4" (6 to 101mm) diameters at 200 to 1,000 FPM (61 to 300 m/min). These air wipe modules come in 12"(304.8mm) long increments with polymer enclosures to capture blow off moisture and sound reduction. The easy access clam-shell enclosure with manual latching eliminates close clearance line threading and the auto-pneumatic option opens the cover to allow knots to pass without binding or jamming. Internal wire clearance ranges from 2 to 8 times the extrusion diameter. Sonic blower models range from 3 Hp to 20Hp (2.2 to 15 kW). The complete dryer module is all prepackaged with the blower connections and adjustable height mounting stand ready to assemble in minutes. Replace compressed air wipes for fiber optic and metallic cable from 40 AWG through 00 AWG (average wire gage) with extruder speeds of 1,000 to 10,000 linear feet per minute (300 to 3,000 m/min). The dryer module is enclosed in a 42" (1,067mm) long polypropylene moisture and sound reduction enclosure (as low as 80 dbA) available with either manual or pneumatically operated clam-shell split housing design for unobstructed access. Several split ceramic eye guides are located along the wire travel center line for easy threading. 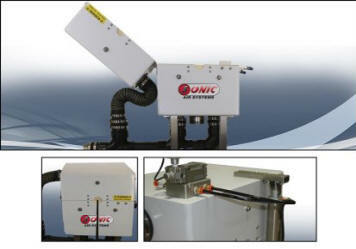 Sonic blower model and motor power range from 15Hp to 25Hp (11-18.5kW). The complete dryer module is all prepackaged with the blower connections and adjustable height mounting stand ready to assemble in minutes. This "air ring" design is for any continuously water cooled non-wire core products which are unsupported, have low tension and are without internal stiffening components within the extrusion. This air wipe provides a 2-3/4" (69.85mm)ID adjustable 360° air slot to deliver lower velocity air at more uniform flow to dry while preventing turbulence to soft extruded shapes. Sonic blowers range from 3hp to 15hp (2.2 to 11kW). 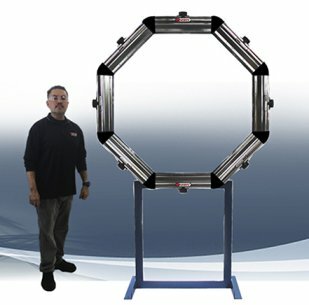 This "air ring" design is for any continuously water plastic and metal tube and pipe manufacturers have been supplied with a variety of custom designed Sonic Air Octagon for these large diameters after cooling, washing or hydrostatic pressure testing. Sonic develops these air rings to deliver 360° air wiping action powered by the Sonic blower needed to deliver the high impact air velocity needed prior to welding, ink coding, coating or painting. Sonic blowers for the octagon range from 15Hp to 50Hp (11kW to 37.5kW). If you make things wet, we can make them dry...please fill-out our online inquiry form for a detailed proposal in just a few days.